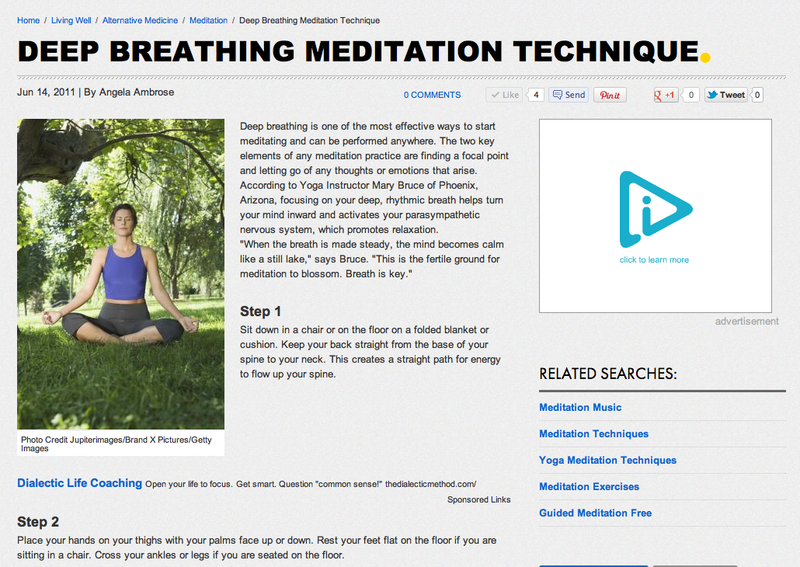 Yoga with Mary Bruce Media. Articles Mary has written for publication and videos where she is featured. Yoga allowed my to find my own voice and to share what is dear to my heart. I train teachers and I love to help my students remember their own voices and to share it in an authentic way. I’m excited to be presenting Para Yoga throughout Europe and have a desire to continue sharing globally. I am in the process of writing a book, designing a yoga to street clothing line and preparing to launch a new business that involves yoga therapy and floatation tanks. 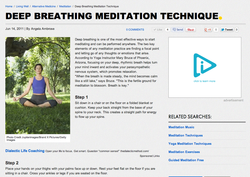 Gather Yoga Announces the GRAND PRIZE winner of their Swiss contest! While our grand prize winner Francelle packs her bags for her once-in-a-lifetime Swiss retreat experience, we’d like to share a little more love with the yogis from our contest. First, we must confess that the point tally was close. So very, very close, in fact, that we felt compelled to recognize and honor the amazing social media outreach efforts of our runner-up: who happens to be none other than Gather Emissary Mary Bruce! To express our appreciation, we have invited Mary to teach at our retreat this summer…and she has said YES! Look for information coming soon about Mary's classes in both Switzerland and France. "Being told I was "too" sensitive used to make me feel insecure and think something was wrong with me. I found ways to numb my feelings that were destructive. Finding yoga brought me home to myself. I now know that sensitivity is one of my greatest core gifts. My power lies in my ability to connect deeply to Source and subtly weave my curiosity into the tapestry of my everyday offerings. Now instead of shrinking I welcome and boldly trust my intuition to guide me in becoming the spark of the Divine I am meant to be." Mary is Gather Yoga's newest Ambassador. "Planes, trains, automobiles…and tour buses? 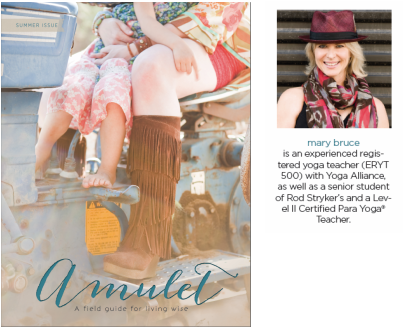 As the on-the-road personal yoga teacher for country music sensation Sugarland, Mary knows a thing or two about keeping grounded while on the move. She is an international "teacher of teachers," and we at Gather have had the good fortune to cross paths with her in both Arizona and Switzerland. 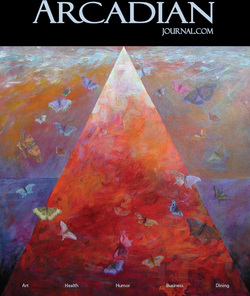 Currently, Mary is teaching the 300-hour advanced training at the Southwest Institute of Healing Arts, in Arizona. Rock on, Mary!" 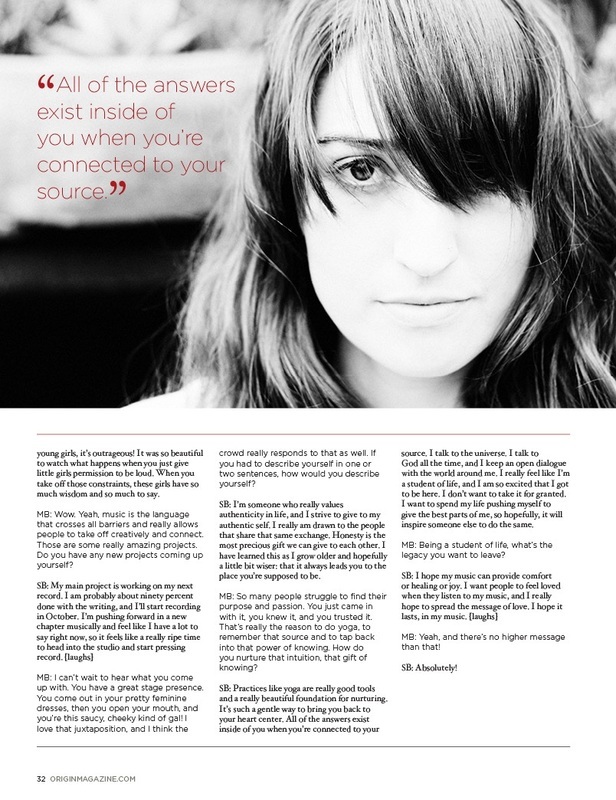 Page 147, read the full article, www.amulet Magazine.com and download the entire magazine here - Amulet Magazine. Fire is the element of Summer and relates to the energy of creativity, intuition and motion. Imagine a world without fire, light or heat. Nothing would exist. Fire is the basis of the Universe, the core of creation. In the body its function is to maintain heat and to give warmth to others. In yoga this is the quality of tejas. "In me there is a light that lights the whole world." Let that be the legacy you brave into. Thanks to National Sponsor Southwest Institute of Healing Arts for creating this very cool highlight video featuring the 2013 Yoga Rocks the Park‬ Season with music from The Sweet Remains! Enjoy! 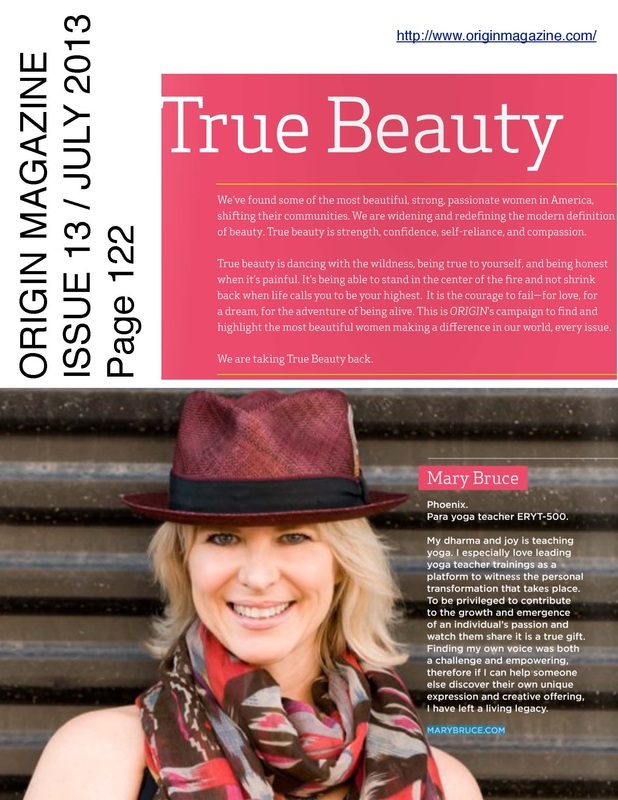 The latest edition of Origin Magazine is now available and features Mary as a True Beauty! 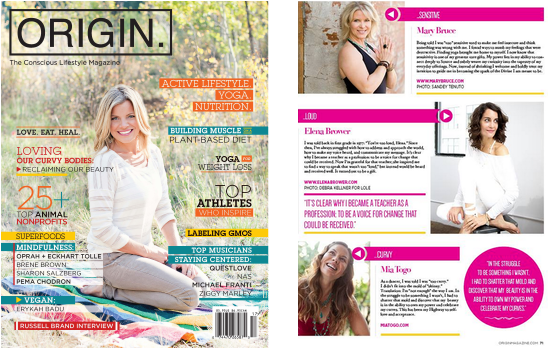 Sugarland Yogi Queen, Jennifer Nettles and her Rockstar Yoga Teacher, Mary Bruce on the show! See Jennifer as the featured Nike spokesperson sharing her experiences and love of yoga with Mary leading her practice. 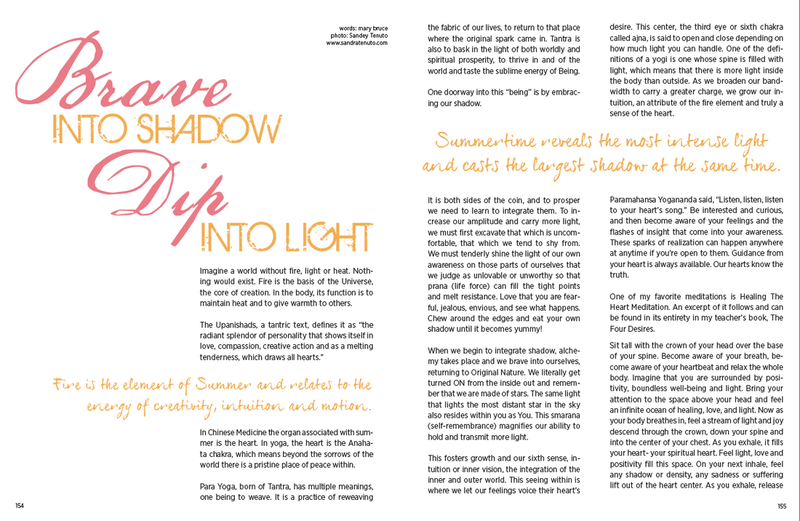 An article in Arrive magazine featuring Mary and the Himalayan Institute. View All New: Seven Mini-Lectures videos from the Himalayan Institute Living Tantra with Pandit Rajmani Tigunait, Ph.D.
100% of the proceeds of this inaugural event will be going to the Shaggy Make a Difference Foundation which was established by the international, Grammy Award Winning Reggae artist, Shaggy to raise funds for the Bustamante Children’s Hospital, the only full service Hospital in the Caribbean dedicated to Children and in dire need of assistance. The Shakti Love Fest is an all day Yoga, Spinning and Music Festival starting at sunrise and ending at sunset. The event will have a “back to the 60’s" theme when love was king and life was beautiful.